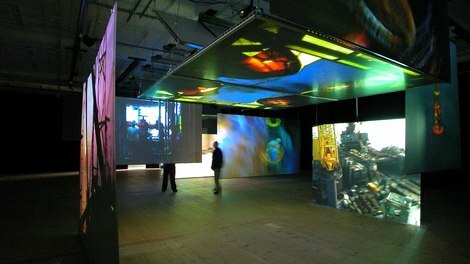 This page contains information on London based galleries which have a strong relationship with artists' moving image work. This list includes commercial spaces, independent and public galleries. These spaces generally do not accept proposals for exhibitions although they are good to be aware of to inform the development of your practice. If there is a particular space you are interested in you could attempt to begin a relationship with the organisation. You can do this simply by keeping them informed about your work and projects. For example, let them know about an upcoming exhibition or screening they may be able to attend. You should also strive to stay informed about their activities as opportunities may arise to present your work to them. The LUX Distribution Guide is an essential resource not only for information on venues and galleries but also for invaluable advice on how to approach potential exhibitors and promote your work. Artquest have extensive listings covering the large variety of London's visual art galleries and spaces. See the Exhibiting and Selling Work section and also their excellent guide to Getting an Exhibition. For up to date listings of current exhibitions see the following publications: Artist Information Company and Art Monthly. Large exhibition space in south London, mainly showing established artists but with openings for less known practitioners. Contact them for exhibitions information or to discuss exhibition opportunities. Cafe Gallery Projects was established in 1984 and is the leading venue for the visual arts in south-east London. It is one of London's foremost smaller-scale galleries and is funded byArts Council England. They platform a wide range of contemporary art practice. This visual arts organisation presents exhibitions, artists' projects, and an extensive educational programme including talks, residencies and workshops, within and around the centre. Many projects are collaborative ventures on an international, national, regional and local level and often feature commissions of new work from artists. Chisenhale Gallery presents innovative contemporary visual art suited to the space and context of the gallery. Exhibitions range from sculpture and installation works, through to artists' film and video. Chisenhale commissions new works from artists and runs an associated education programme. CUBITT was established in the early 1990s as an artist-run studios and gallery in Islington. It is being run as a new model for the progressive development of an artist led space, employing a part-time administrator and providing an 18-month bursary for an independent curator to instigate and develop the gallery programme. Frith Street Gallery has developed a programme of exhibitions by international artists working in painting, photography, sculpture, film and video. They currently represent a group of 21 artists both from Britain and abroad as well as collaborating with other artists on specific projects. Gasworks Gallery is based by the Oval Cricket ground in south-east London and comprises of gallery spaces and fifteen artists studios. Gasworks hosts up to seven exhibitions a year and profiles emerging or mid-career international or UK artists whose practice is of outstanding quality and who have limited previous exposure in London. Haywood Gallery is one of the leading London spaces for displaying contemporary art. The substantial gallery space is housed in the South Bank Centre. Their large scale exhibitions include a range of solo and group shows including work in all media. inIVA creates exhibitions, publications, multimedia, education and research projects, designed to bring the work of artists from culturally-diverse backgrounds to the attention of the widest possible public. Anchored in the diversity of contemporary British culture and society, inIVA engages with culturally-diverse practices and ideas, both local and global. inIVA invites artists and audiences to question assumptions about contemporary art and ideas. The intention of Matt's Gallery is to provide artists with the space and time to develop new ideas and possibly new ways of working while making a new work for the space in which it is to be exhibited. In this way it was hoped to provide the best possible conditions for the making and exhibiting of fine art, in particular to allow for the fine tuning for which there is often not enough time at other galleries. The Serpentine organises up to five exhibitions annually, and is the only publicly funded gallery in London to consistently maintain free admission. The Showroom has existed as a publicly funded contemporary art gallery since 1989. The gallery works with artists in a unique way, supporting them through all aspects of the commissioning process artistically, financially and administratively. The exhibition schedule also allows them the time to develop and realise work on site. The South London Gallery has hosted exhibitions by a range of internationally acclaimed artists such as Gilbert & George, Anselm Kiefer and Sherrie Levine, as well as younger artists such as Tracey Emin, Gavin Turk and Ann Sofi-Sidén and more recently solo exhibitions by Keith Tyson, Christian Boltanski and Joëlle Tuerlinckx. The Whitechapel Art Gallery run a programme of large scale exhibitions, performances, talks, seminars and films. A good way to get your work exhibited, especially if you are a recent graduate, is to enter group shows and/or competitions. There are various opportunities that emerge throughout the year for one off shows. Calls for group exhibitions are often based on a specific theme or can be based on open submission of work. We recommend the listings inAN MagazineandArtquestfor up-to-date information on new opportunities. New Contemporaries gives art school students and recent graduates the opportunity to show their work in the context of a professional art gallery. It is important in that it takes the work out of the educational context and into the art world. New Contemporaries is totally independent organisation that allows applicants a democratic chance for the work itself shine. The annual exhibition is selected from slide, film, video, CD, proposal, and then at a second stage from a shortlist of the work itself. Visit the website for details about the 2006 application process. S1 / Salon is a season of artist short film and video programmes hosted in the project space at S1 Artspace, Sheffield. Over the past two years the salons have screened over eighty films by artists based in the UK and overseas. Programmes from the first season have been hosted in exhibition spaces across the UK. S1 / Salon is curated around material selected from an open call with the intention of creating a platform for presenting artist film and video without prescribed themes or categories. There are no stipulations for material other than the work must be under 30 minutes. Each salon features archive material selected by an artist working in the moving image. The Film London Directory contains details of a range of companies which provide exhibition equipment specifically for artist film-makers.